Organize music albums of any format: vinyl LP, Audio CD, MP3, FLAC, APE, OGG, and others. Create an illustrated music catalog containing covers, track lists, reviews of albums. Download discographies, biographies and photos of your favorite artists. Musicnizer keeps every bit of information about music that is important to you. It is your own music encyclopedia. Try it now! If you do not know where your favorite Audio CD can be found, just start Musicnizer. The program has special fields for disc# and location, so you can specify where exactly your Audio CD and DVD discs are. The built-in loan manager will help you to keep track of all CDs that you give your friends. With Musicnizer you never need to wonder if you had some album and just cannot find it anymore, you simply take the album from wherever it is kept. Furthermore, you can create lists of albums that you are planning to purchase or download. Musicnizer can scan your audio files and create a colorful music catalog. The program will download cover art, track lists, reviews, and other information of your choice from the internet. Just browse the catalog full of interesting information instead of looking at filenames. Of course, you can start playing albums or individual tracks directly from the catalog, using either the built-in audio player or any other media player. One of the most exciting features of Musicnizer is its ability to find connections between albums and artists. Album reviews, facts, discographies help you to learn more about the world of music and to discover new items worth of your attention. With Musicnizer you will know when and where exactly a particular band was founded, which albums it released, where its former members went to later, and much more. At some point you will notice your friends asking you how it can be possible to know all of this. While without artists there could be no music, most music database programs ignore this fact and only list artists as an unimportant bit of additional information. 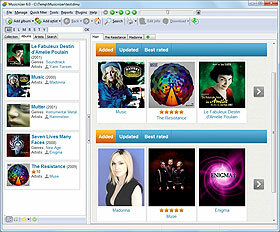 Musicnizer uses a different approach: artists have their own place in the catalog, and the program does its best to download as much information as possible. Depending on the download options that you set, Musicnizer can download the complete discography of the selected artist, photos, a biography, and other important facts. Navigate to albums that you do not have in your collection yet, download information about them to see if they are of any interest to you.